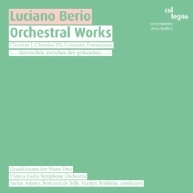 The second CD of col legno’s WIEN MODERN Edition is dedicated to Luciano Berio, who throughout his life kept on searching for new sounds, and new instrumental and orchestral organizing principles in his work. His Sequences for solo instruments are among the most important landmarks in recent music; later on, Berio decided to "comment" on some of these notoriously complex solo works from an orchestral perspective. Chemins and Chemins IIb are adaptations of the Sequences for harp and viola. "The best way of analyzing and commenting on a musical work is to write another work, making use of materials of the original piece." (Berio) In his Concerto for two pianos and orchestra Berio chooses a differen-tiated and episodic approach to unravel the tangle of relationships between the orchestra’s instruments and the two solo pianos. In Formazioni Berio connects different "formations" of the orchestra with each other, completely upsetting the traditional arrangement of a classic symphonic orchestra and creating fascinating new sound mixtures in the process. The "oscillating inner polyphony"
(Berio) of these mixtures was skillfully unraveled in the pointed and highly differentiated interpretation by Stefan Asbury and the RSO Vienna at their WIEN MODERN concert of 15 November 2007. The exceptional violinist Patricia Kopatchinskaja not only impresses audiences and critics – she also inspires eminent composers like Kühr, Resch & Zykan.